The Void offers solid stereo audio, but its weak surround-sound and assorted quirks prevent it from being a standout pick. It's hard to write a pointedly bad word against Corsair's Void Wireless Dolby 7.1 headset. It has pleasing sound, excellent battery life, a comfortable fit, and tasteful RGB lighting effects. And yet, it's not a standout gaming headset, thanks to weak virtual surround sound and a number of tiny details. You can improve the experience by using the latest beta version of its companion software, but even that scenario comes with caveats. Placing these cans in your shopping cart is more an expression of faith in software and firmware updates than it is a commitment to immediate, superb audio quality. That's not to say the Void sounds terrible. When using the official release of its companion software (version 1.10.67 at the time of this writing), it provided clean audio across music, movies, and games, with a fair balance between lows and mids. Mids and highs do lack a crispness that would help make background details more distinct, though; some get softened to the point where it can be hard to pick them out. Bass isn't the strongest, either. If you're hunting for pounding lows, look elsewhere. What you hear on the "pure" (non-adjusted) preset is about as much bass as you'll get, even after fiddling with EQ settings in the companion software. That applies when the Void's surround sound mode is on, too. You won't want to spend much time with it on, though. Turning on surround when using the official version of the Corsair Utility Engine causes a drop in audio quality: voices become more distant and harder to make out, and you don't get clearer and finer directional cues to make up for it. It's simply a better listening experience with the virtual surround off. The same advice applies to the "Sidetone" feature for the microphone, which allows you to hear yourself through the headphones while talking so you don't sound muffled to your ears. It also introduces a persistent buzzing that only gets louder as you increase the volume. Since you can't really hear yourself with Sidetone set to a lower volume, the best experience is to avoid it all together. You'll still be able to make out your voice reasonably well, since the earcups don't tightly block out nearby external sound, and you won't hear that nasty buzz. Some of these shortcomings can be solved by instead installing the latest beta version of CUE (currently version 1.11.85). Bass gets punched up a bit; background details gain more clarity; Sidetone's buzzing gets quieter; voices are less distant in surround-sound mode. The beta version of CUE also fixes a host of oddities that we encountered with the official release software (and even one quirk identified by Corsair as a likely firmware issue). During our tests using CUE v1.10.67, the headset volume inexplicably jumped down at one point when someone began talking in during a Google Hangouts video chat. We got occasional pops and crackles in running audio despite being within a foot of the receiver with a clear line of sight. And strangely, every press of the microphone's mute button (regardless if you're muting or unmuting) lowered the headset's volume; in one instance, it flat-out muted incoming audio. We ran our tests on a Windows 7 machine, which is listed as supported by the headset, so it was all very puzzling. For recommendations on our favorite gaming headsets after dozens of tests, check out our guide to the best gaming headsets. These issues all disappeared when we tried CUE v1.11.85. The problem is that right now, easy access to this beta software doesn't appear to exist. If you search the Corsair website and its forums, it doesn't turn up. We were provided the direct link and have asked if it's publicly available, but Corsair was unable to confirm if it's been posted in its forums. The company did indicate that these tweaks will become public in the near future, though. Regardless of when updated software arrives, there are aspects of using the Void that remain the same no matter which version of the software you install. Build quality is very nice—these cans feel sturdy without being excessively heavy, and are among the more comfortable we've worn. The Void does leak more audio than other headsets in its class, though, and as mentioned earlier, it also doesn't block out much nearby external sound. Equally notable is the Void's battery life, which exceeded Corsair's rating of "up to 16" hours in our actual-use tests. Its longest run went just over 17 hours when we kept the volume to 20. It hits a full recharge at a reasonable rate too, with just a few hours dedicated hours needed. If that's not fast enough, you can use the headset while juicing up. You won't always be able to accurately determine how much battery life you have left or the headset's charging state, though. Both versions of CUE couldn't faithfully monitor either. At one point, we saw a sudden drop from 95% to 91% using CUE v1.10.67; another time with CUE v1.11.85, we got reports of the battery being at 33% and then 43% after a few repeated instances of plugging and unplugging in the charging cable. And while plugged in, we had to restart both software versions more than once for it to report the headset's charging status. Battery life exceeded Corsair's rating of "up to 16 hours" in our actual-use tests. And that's just one of the assorted issues that remain constant. Regardless of which software version you use, the microphone sounds distant (though clear) to people you chat with if it's not bent in toward your mouth; if you do move it closer, then your breathing becomes audible. The Void's range also doesn't extend very far, as a solid wall or door can shorten how far you can wander quite dramatically; audio dies instantly once you cross an invisible threshold. It does, however, instantly reconnect the moment you step back in range. 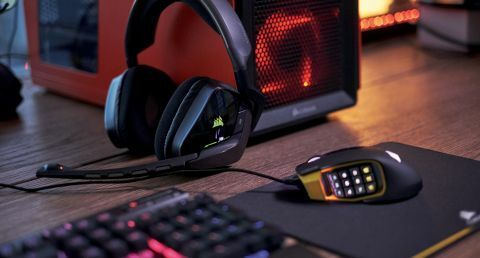 There are lingering oddities, too—like Corsair's strange choice of having the Void show an initial rotating set of colors before CUE is installed, then switching over to a default RGB profile of blinking red lights once the software is active. If you don't remember to set the headset as your default playback device, you may mistakenly think the headset has an issue. And folks seeking a proper user manual have to head to the Void's dedicated webpage and not follow either of the two user manual links in CUE—they send you to Corsair's downloads page, which only offers CUE itself. It's a pity that the Void feels like a work-in-progress. Its good points are solid, but its quirks and disappointments drag it down. The headset's software and firmware need more polish, and it appears that those tweaks will come in time, but currently, you won't get an outstanding headset. Some aspects of these cans may never change, too—like the overall mediocre quality of its surround-sound. At $140 for the standard model, and $160 for the special edition "Yellowjacket" model, you can find competing headsets in the same price range with similar features and stronger performance. They just won't glow softly in the dark, pulsing in time with a beat that you set yourself.